Many years ago I was on a township educational tour in Langa. 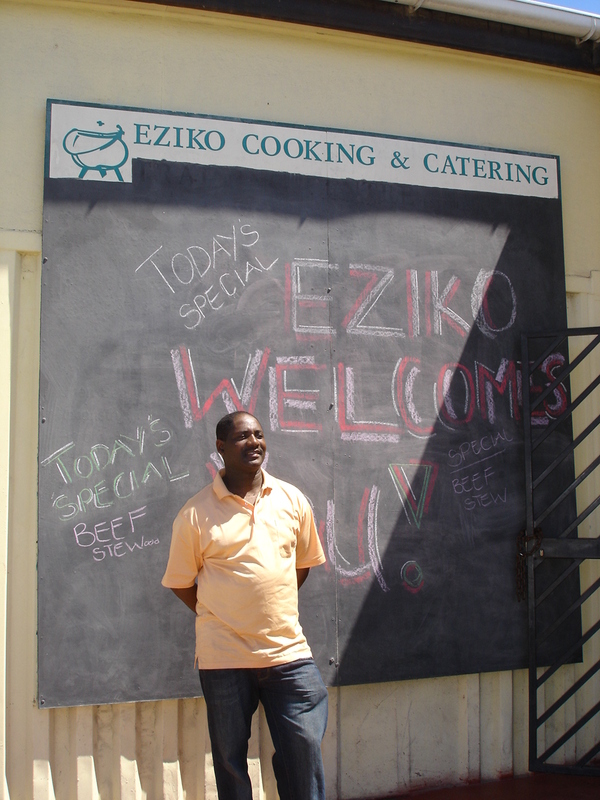 Out of the side of my eye I spotted a sign that said Eziko Cooking & Catering School. I quickly jotted down the number and added it to my “to do” list to go and explore. Being a typical white South African it took me a long time to set up the meeting as I was scared to drive into a “township” on my own. How sad is the legacy of our past that until the age of 19 I had never ever been into a township, and even worse in my early 30’s I had still never ventured in on my own. Finally I called them and set up a meeting with the owner Victor, and the head chef Lindy. We discussed the idea of setting up a tour where people could come and visit the school and restaurant and learn to cook African cuisine. 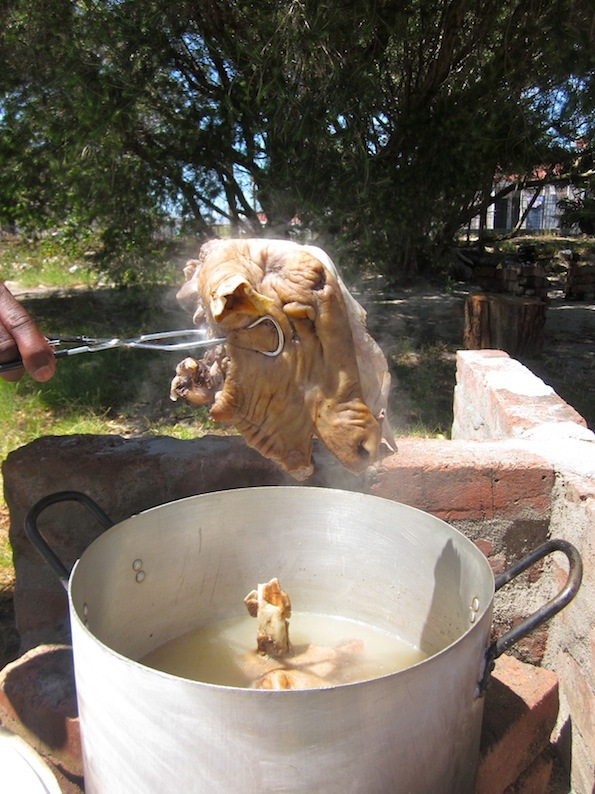 Lindy offered to include the preparing and cooking of Tripe – a big local delicacy. Somehow, I did not think that this would be a hit with visitors – so tripe was vetoed! Agreed on would be dishes that would reflect what more then 70% of our population eat on a daily basis: Pap, Samp & Beans, a meat stew, chakalaka, a veg dish of mixed cabbage/spinach and more recently on request a “smiley!” African cuisine is not viewed as “gourmet” and as such is not easy to find on a visit to South Africa. It is very much a “home” cuisine. How frustrating for a foodie who wishes to experience what people eat in a country, to not be able to try it very easily! So what are the main dishes that Black South Africans eat? The staple diet of our people is maize. For the vast majority of tribes, the main ingredient in all meals is what we call Mielie Meal. This is quite simply dried corn that has been ground down to a fine powder (similar to Polenta – but white). 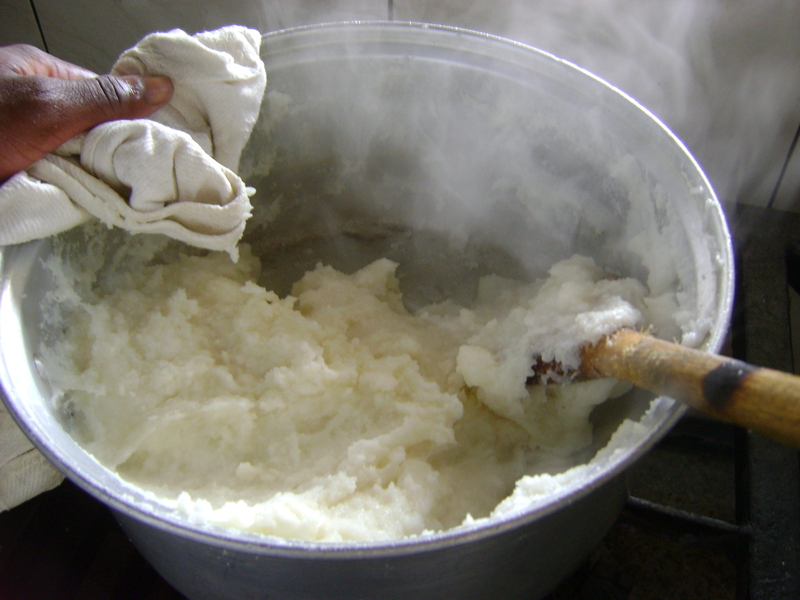 For breakfast, most people would cook it into a porridge that is so stiff that it eventually starts crumbling – this is called krummel pap (this literally means crumbly pap). This is usually eaten with sour milk and sugar. For lunch and dinner people eat “pap”. 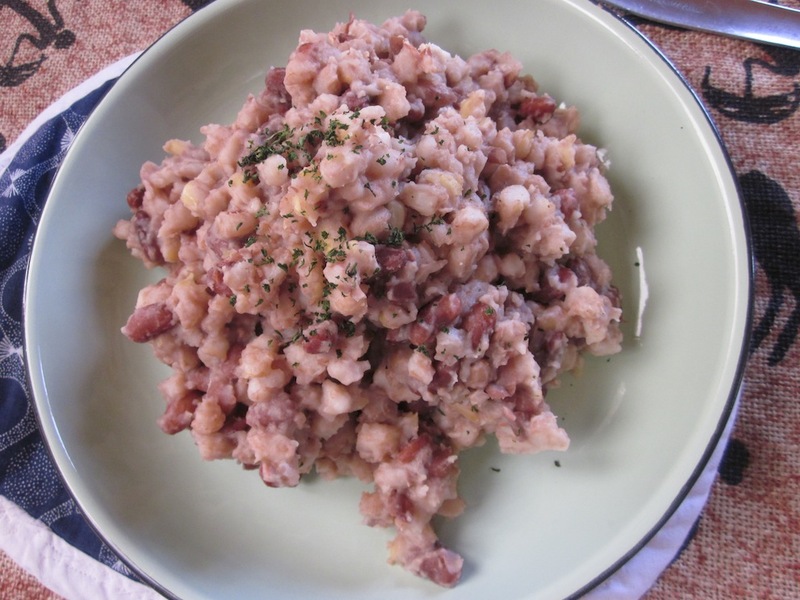 This is a fairly thick porridge and it forms the starch base much as rice or pasta would in Western cuisine. The exception to this are the Xhosa people (from the Eastern Cape), they eat samp. Samp is quite simply the dried corn. 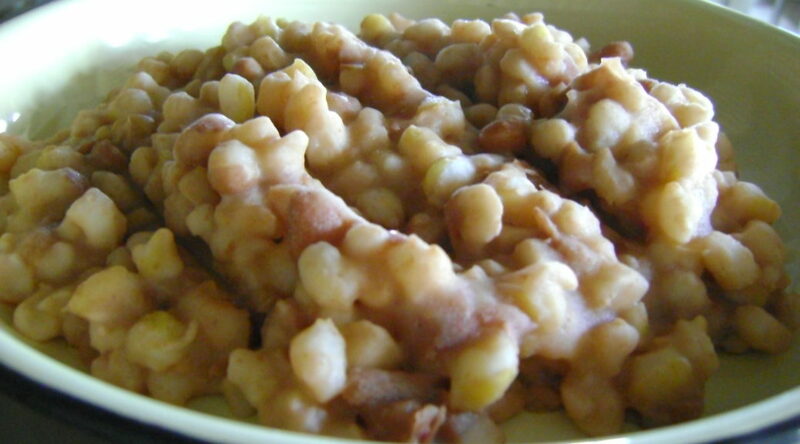 Often the samp is combined with dried beans for additional protein. In the rural areas, ladies will cook the samp in a black pot over the fire. It takes many many hours to cook – thank heavens for Western cooking techniques – now it only takes about 3 hours on a gas stove to prepare! Most of the black people in Cape Town are originally from the Eastern Cape and have moved down here over the last 100 years. As such a lot of samp is eaten in Cape Town. The consistent dietary theme across all of our tribes is the love of meat – NYAMA! A meal is not considered a meal without meat. As such meat or a meat stew is served with lunch and dinner if you can afford it. In the township areas one of the main take away dishes is meat from BBQ’s (called BRAAI’S in South Africa) on the pavements. People will stop and buy a piece of chicken or a lamb chop or a sheep’s head. Yes, you read correctly. Sheep’s heads are considered a delicacy by the Xhosa people and are called “Smileys”. The name comes from the fact that when you cook the sheep’s head, you will know it is ready when the lips curl upwards – it smiles at you!!! 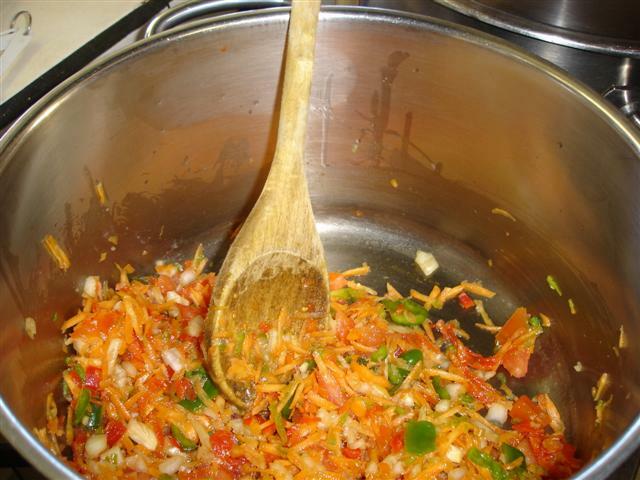 Chakalaka is a spicy vegetable relish that is often served with the pap/samp and meat stew. There are many variations of this recipe – often it uses up the left over vegetables you have in the house and is usually quite fiery! 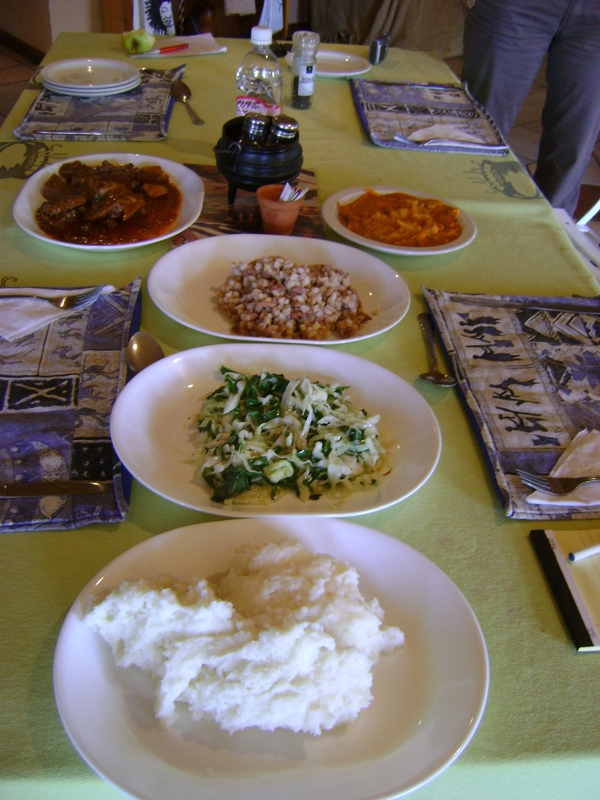 We have now been running the cooking tours to Langa for about 6 years. It is never going to be a big seller as people seem to be averse to the word “cooking” being in a tour description. The visit here is however so much more then a cooking experience! Here you have an opportunity to meet local people, to chat about their lives, the project they are involved in (teaching kids basic cooking skills to get jobs), their culture, their history and their hopes for the future. Too many tours just enter this region to be voyeuristic and to see what it is like, what a waste to not stop and meet our very beautiful and passionate people while you are here. 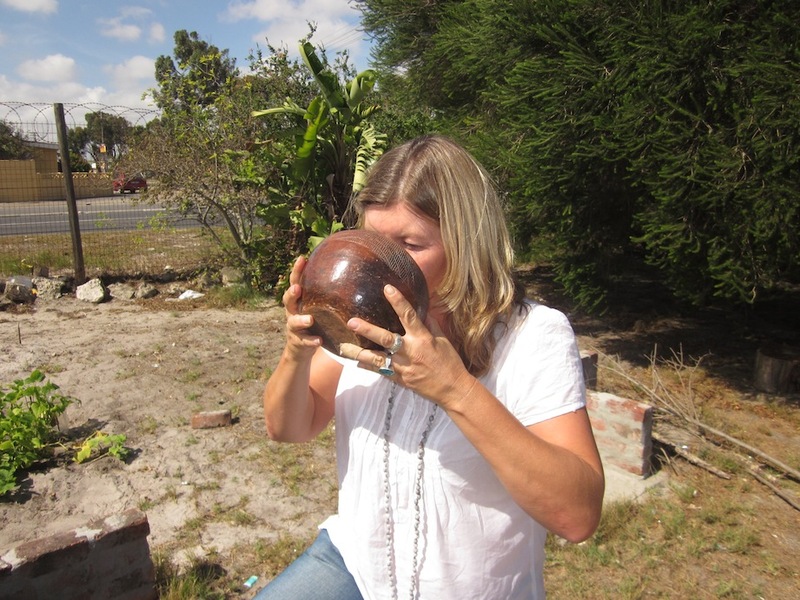 The classes are headed up by Lindy – she is a legend! She loves the classes and loves to meet people from all over the world. Lindy is now retired from her main job as head chef and as such it is a special treat to her too to come in for the classes. She was part of the original meeting to discuss setting it up and as such it is as much her baby as it is mine. Lindy is a wealth of knowledge and represents a very passionate energy in the kitchen. Watch out, there is no slacking on the job as Lindy puts you through your paces in her kitchen, you are here to work! 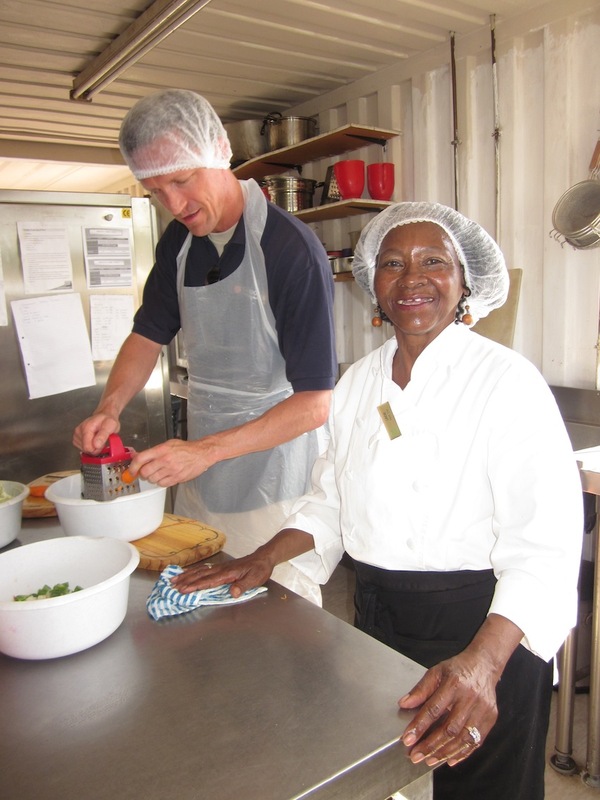 Note that no cooking experience is needed to come and visit them – Lindy will put you through your paces. This works for everyone of all ages and is a great one for kids and families. 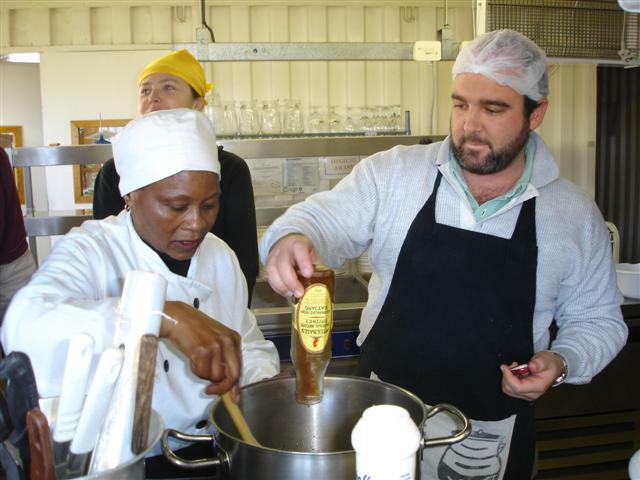 To find out more about the cooking classes, visit my Cape Cooking Classes section on the website or just click here.